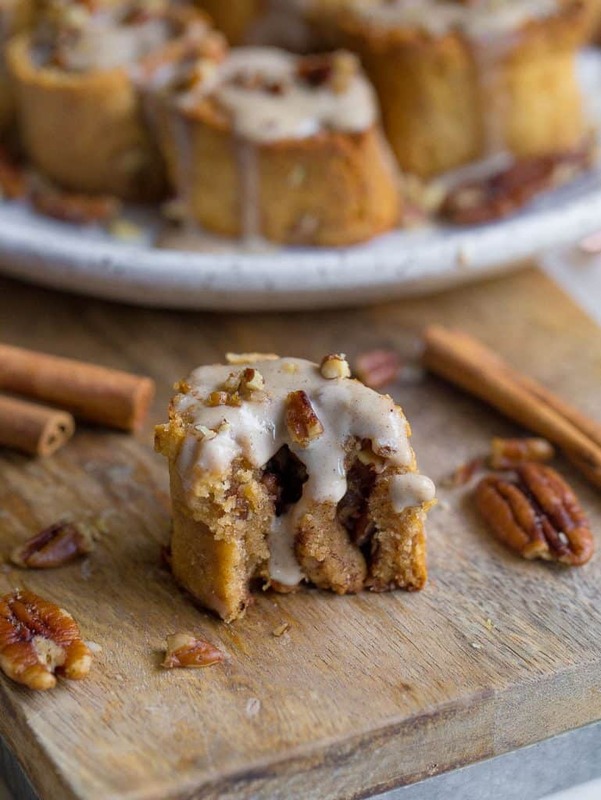 Paleo Pumpkin Pecan Cinnamon Rolls are such a delicious weekend fall breakfast! Ooey, gooey, with a delicious pumpkin spice cashew cream frosting. 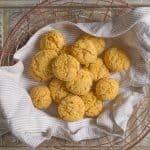 Recipe is refined sugar free, grain-free, and gluten-free, but no one has to know! Are you finally feeling that change in the air this week? Those crisp fall mornings where a sweatshirt is needed to walk the dog, and and the smell of cozy pumpkin spice are two of my favorite things about fall. We can also add scarves, tall boots, plaid shirts, sweaters, and changing of the leaves to the list. 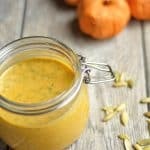 Want to know a new fall favorite of mine? 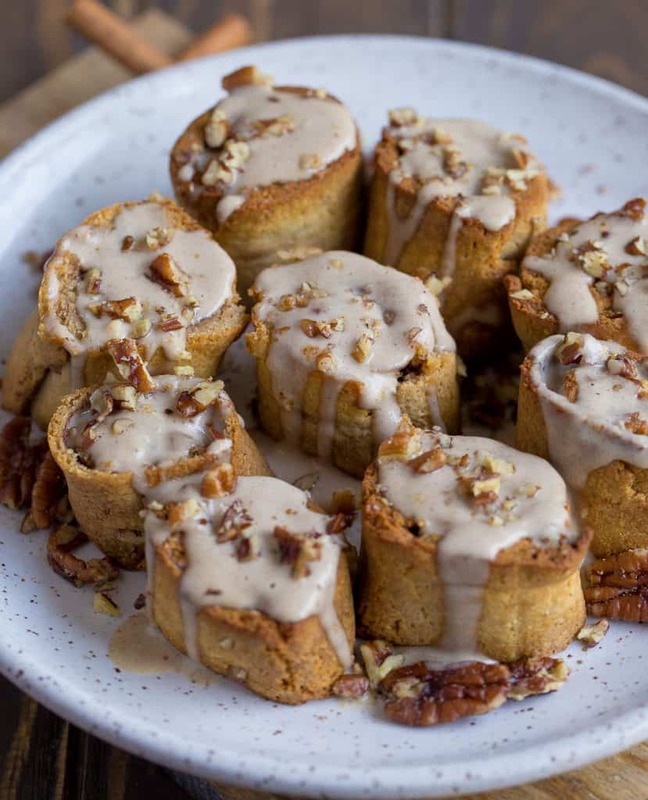 Pumpkin Pecan Cinnamon Rolls! These mini cinnamon rolls were kind of the perfect treat on a cool fall morning after my September round of Whole30. This is the second year in a row where I did a fall Whole30 right as a reset from summer shenanigans. Baked goods are one of the things I miss the most while on Whole30! So I definitely wanted to choose my treat wisely…….. Instead of chocolate, I opted for something more seasonal with pumpkin. 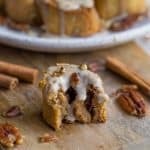 These Pumpkin Pecan Cinnamon Rolls surely did not disappoint! Slightly golden on the top, but a perfectly buttery like and perfectly spiced inside. 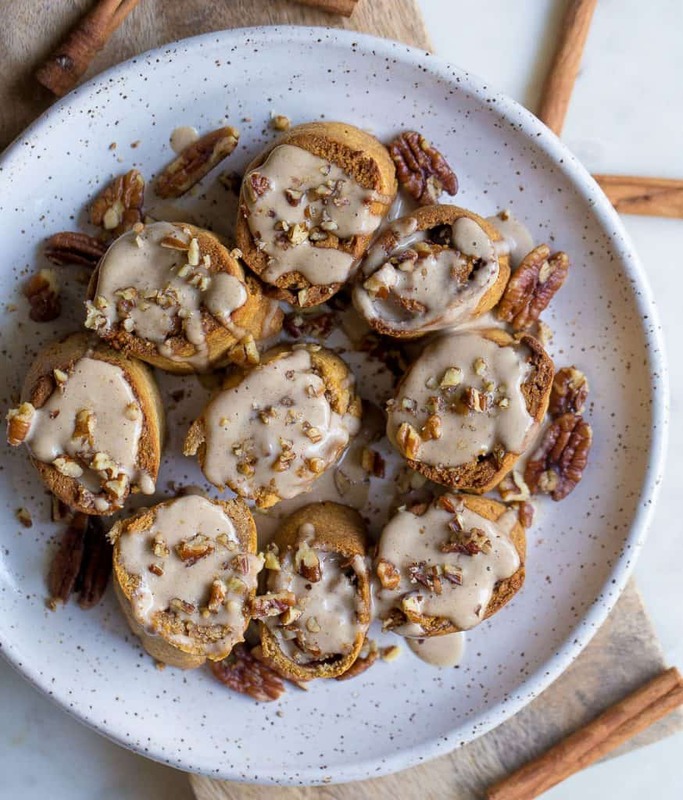 We start with an easy slightly pumpkin flavored dough, add in some diced pecans, dates, and cinnamon for the filling, roll them up and slice to bake, and then finally top with a creamy cashew pumpkin spiced icing. Best served along side a cup of coffee or tea. A fantastically delicious weekend breakfast, after school snack, or even a dessert. Serving warm out of the oven is not necessary, but highly encouraged! 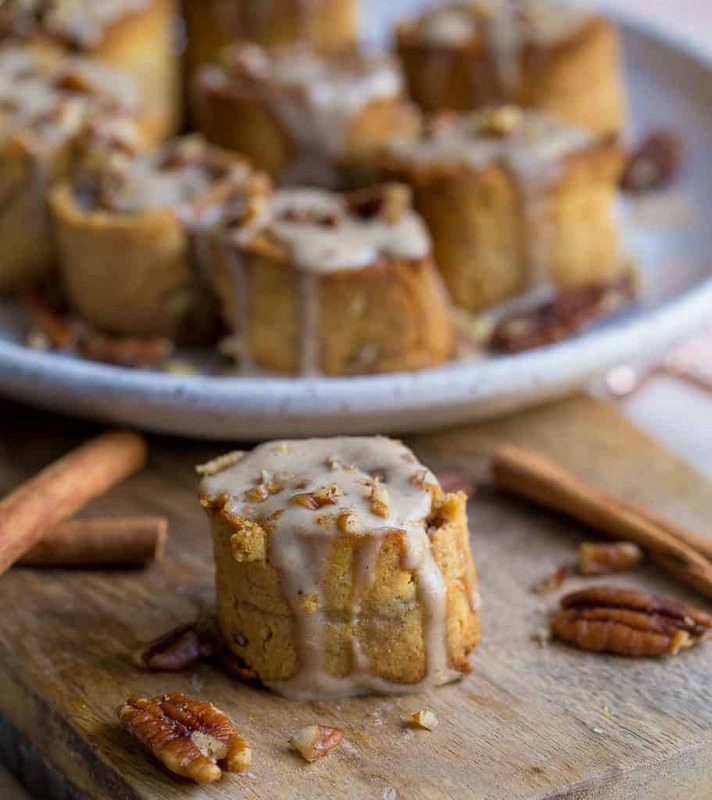 **Note that this recipe can be halved for about 10 small cinnamon rolls. I went ahead and made the recipe larger because it was easier to make more cashew cream topping. These can also be frozen, with the glaze or icing stored in the fridge and slightly warmed before serving. For the dough: In a small bowl, whisk together dry ingredients: both flours, pumpkin pie spice, baking soda, and salt. In a separate bowl, whisk together wet ingredients: eggs, coconut oil, pumpkin puree, maple syrup, and vanilla extract. Add dry ingredients to wet, and continue to mix until a thick dough is formed and all dry pockets are incorporated. Divide the dough in two equal parts, you will be making two separate "rolls" . Place each piece of dough between two large pieces of parchment paper, and roll out into a large rectangle (about 15 x 6 inches). 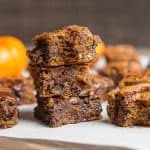 Drizzle with a bit of maple syrup, top with cinnamon, and sprinkle each rectangle with 1/4 cup dates, and 1/4 cup pecans. Very carefully, begin to roll the dough at the long edge, rolling nice and tight. Place each roll into the freezer to get firm, for about 20 minutes. Preheat your oven to 325 degrees. Remove each roll from the oven. Slice each roll into pieces that are about 1.5 inches thick, and place on a baking sheet. Bring the pan to the oven, and bake for 12 minutes, or until the top is slightly golden. Meanwhile, make the cashew cream icing. Be sure that the cashews have been soaked for at least 15 minutes, up to overnight. Drain the water from the cashews. 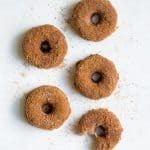 Place inside a small food processor or blender along with the pumpkin pie spice, syrup, and coconut milk. Blend or pulse until cashews are completely broken down. Stopping to scrape down sides of the blender or food processor. Gently brush each cinnamon roll with a few tsp of the cashew cream. Serve warm or at room temperature. Can you make these the night before and bake them in the morning? I haven’t tried it, but it should work! Make the icing in the morning.